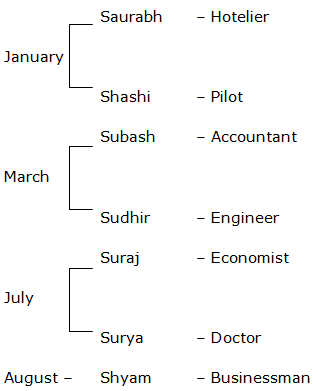 Seven people Akshay, Amar, Abhay, Adarsh, Abdul, Arjun and Ashok have an exam in seven different months (of the same year) namely January, February, March, June, August, October and December , but not necessarily in the same order. Each of them likes different topic in mathematics namely Algebra, Geometry, Dynamical systems, Number theory, Combinatory, Calculus & Analysis and Mathematical physics, but not necessarily in the same order. Akshay has an exam in the month which has less than 31 days. Only two people have an exam between Akshay and Adarsh. The one who likes Algebra has an exam immediately before Adarsh. Only one person has an exam before the one who likes Dynamical systems. Amar has an exam immediately after one who likes Dynamical systems. Only three people have an exam between Amar and the one who likes Combinatory. Abdul likes neither Combinatory nor Dynamical systems. Abhay has an exam immediately before Abdul. Ashok likes Mathematical physics. The one who likes Geometry has an exam in the month which has less than 31 days. The one who has an exam in March does not like Number theory. 1. In which of the following months does Adarsh have an exam? 2. Who among the following have exams in January and June respectively? 3. How many people has/have an exam between the month in which Ashok and Akshay have exams? 4. As per the given arrangement, Akshay is related to Algebra and Amar is related to Number theory following in a certain pattern. Which of the following subject Ashok is related to? 5. Which of the following topics does Arjun like? Seven persons Saurabh, Shashi, Shyam, Subash, Sudhir, Suraj and Surya visit Taj mahal on four different months – January, March, July and August – in a year. At least one person but not more than two person visits the Taj mahal on each of these months. Each of them is working in different professions – Accountant, Doctor, Engineer, Hotelier, Economist, Pilot and Businessman. Saurabh visits Taj mahal on January with pilot. The Engineer does not visit Taj mahal with Shashi and Suraj. No one visits Taj mahal with shyam. Suraj visits Taj mahal on July. Subash visits Taj mahal on March and he is not engineer. Sudhir visits Taj mahal on March. Suraj is not pilot. The Engineer visits Taj mahal with Accountant. The Hotelier visits Taj mahal on January. Surya is neither Economist nor pilot. The businessman visits Taj mahal neither with the pilot nor on July. 6. What is the profession of Surya? 7. On which month of year does Shashi visits Taj mahal? 8. Who among them visits Taj mahal along with Surya? 9. On which of the following months do Doctor and Economist visits Taj mahal? 10. What is Saurabh’s Profession? 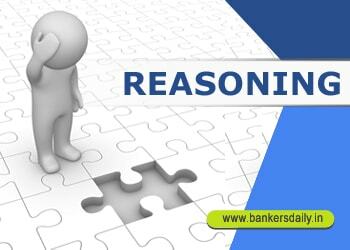 Can I have a detailed solution for the reasoning prob in day 22?